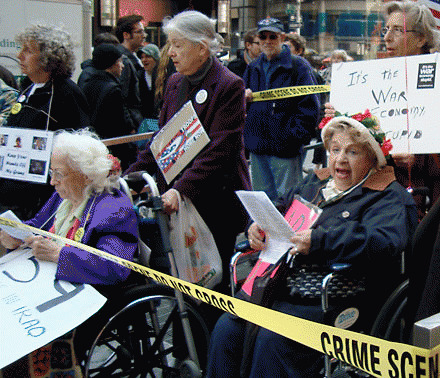 The "Granny 7," the seven intrepid women of the Granny Peace Brigade who were arrested and jailed on March 18, 2009, when they protested at the Times Square recruiting station against the Afghanistan war escalation and the retention of 50,000 troops in Iraq after the official withdrawal date, achieved a victory April 14 for the First Amendment principle protecting peaceful protest. At a court appearance at Manhattan Community Court, it was declared that the City of New York "declined to prosecute." It would seem that the decision was influenced by the arrest of 18 Granny Peace Brigade members on Oct. 17, 2005, when they tried to enlist at the Times Square recruiting center to replace America's grandchildren in harm's way in Iraq. Those grannies were put on trial for six days in criminal court at the end of which they were acquitted. The resultant world-wide publicity did nothing to polish the image of the Big Apple -- photographs and television footage of old women being handcuffed and poured into paddy wagons for non-violent protest tended to make New York's Finest look more like New York's Meanest. One can logically assume that the decision of the D.A. 's office not to prosecute on April 14 indicates a less punitive stance by the authorities toward peaceful dissent, a First Amendment privilege. It is hoped that this is indicative of a softer policy of New York City to public protest. Non-violent demonstrators during the last few years have met with harsh treatment, most notably at the Republican convention of 2004 when many were incarcerated for up to two days in a dirty old pier with no sleeping facilities. Prisoners had to sleep and sit on a filthy and oil-stained cement floor and were given hardly any food. Compensation has been paid to some as a result of lawsuits lodged against the City, and many cases are still pending. The seven grannies are Jenny Heinz, 65; Beverly Rice, 70; Joan Pleune, 70 (one of the original Freedom Riders); Barbara Walker, 75; Nydia Leaf, 76; Carol Husten, 77, and Lillian Lifflander, 89 (a World War II veteran). Ms. Lifflander was unable to make the court appearance because she was admitted to a V.A. hospital with chest pains the night before. Once the decision was announced, the Granny Peace Brigade marched down Broadway to the Times Square recruitment center, the scene of both their arrests, and briefly demonstrated, again putting a strip of yellow crime scene tape in front of the military building. They vowed to continue their struggle to persuade President Obama to reverse his Iraq and Afghan policies. The grannies mostly have been enthusiastic supporters of the President, but feel he is making a tragic mistake . "We are doing what he asked us to do -- to let him know when we think he is off on the wrong track," said one of the women. The eminent civil liberties attorney, Norman Siegel, who represented the grandmothers in both the 2006 trial and the current case, stated: "These grannies are women of conscience. They acted in the great American tradition of peaceful non-violence. They protested our government's military involvement in Iraq and Afghanistan. They should be applauded."